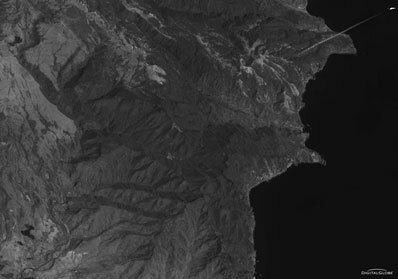 Video footage obtained by The Associated Press and a remarkable commercial satellite image of the ill-fated North Korean launch are providing new insights into the rocket. The Taepo-Dong 2 lifted off on 235,000 pounds of thrust during its Sunday mission to launch a North Korean satellite while continuing development of the vehicle as an ICBM that could threaten the U.S. These images from North Korean state television aired by the AP on Tuesday provide far more engineering detail on the rocket than has ever been made public since its first mission 11 years ago that failed, as did the most recent launch. Also in a perfect feat of timing, the U.S. commercial DigitalGlobe WorldView 1 spacecraft was flying near the Musudan-ri launch site at the 11:30 a.m local liftoff time. 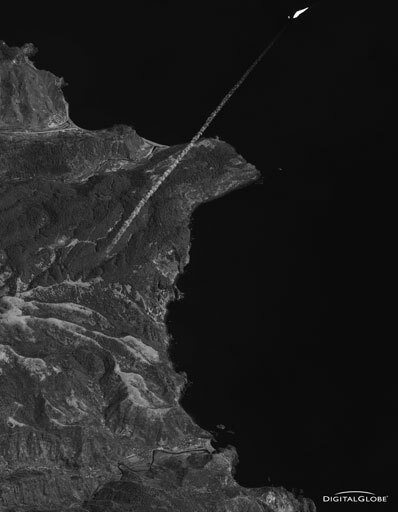 The high-resolution satellite was able to image the rocket's vapor trail and the flame-plume of the rocket itself as it headed east toward Japan. The flight failed after separation of the first stage five minutes into the flight when either the second stage shut down early or suffered a guidance problem. The second and third stages and payload fell intro the Pacific Ocean after a 1,900-mile flight that, although a failure, was about twice a far as the vehicle got in its first mission flown in 1998. A second test in July 2006 also failed when the vehicle exploded about 40 seconds after liftoff. The launch site footage posted by the AP on YouTube shows the launcher's solid propellant third stage to be somewhat wider and larger than earlier DigitalGlobe unclassified imagery of the vehicle on the pad revealed. The North Koreans have likely received substantial technical aid from Iran for development of the third stage which has yet to be tested in space. The payload shroud is also more conformal and less bulbous than the earlier DigitalGlobe imagery indicated because of shadows or aspect angle. Both the 235,000-pound thrust first stage and 65,000-pound thrust second stage are powered by nitrogen tetroxide and an 80/20 percent mix of kerosene and gasoline. Unlike the first flight test of the vehicle in 1998 when it was painted black, the North Korean's painted the vehicle flown Sunday white, with red Korean writing and the country's flag. This was more in keeping with the North Korea's stated purpose of launching a low altitude "communications" satellite that was to play patriotic music from space. North Korea released no pictures of the 2006 vehicle, so it is unknown how it was painted.